NEW YORK (Reuters) - Democrats rode a wave of dissatisfaction with President Donald Trump to win control of the U.S. House of Representatives in midterm elections on Tuesday, giving them the opportunity to block Trump's agenda and ramp up scrutiny on his administration. 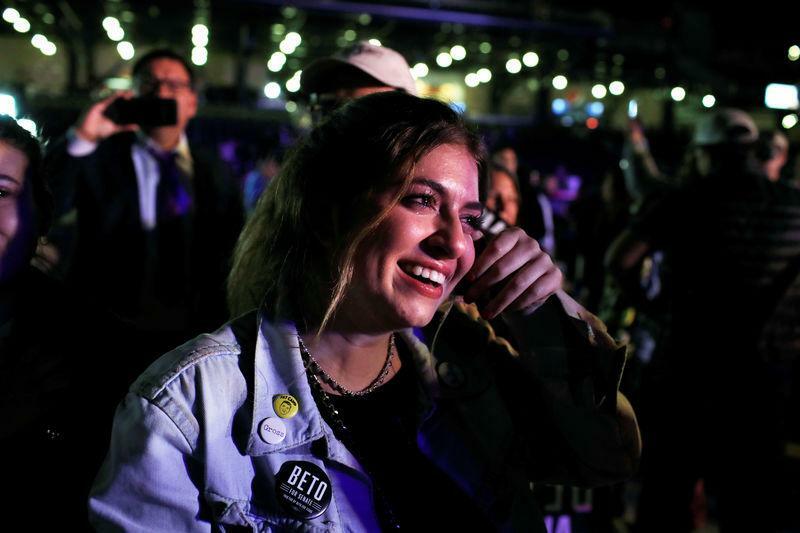 Two years after his surprise win of the White House,Trump and his fellow Republicans expanded their majority in the U.S. Senate, following a divisive campaign marked by fierce clashes over race, immigration and other cultural issues. MARKET REACTION: STOCKS - U.S. S&P 500 e-mini futures were up 0.6percent. MSCI's all-country world index was up0.4 percent. BONDS - The 10-year U.S. Treasuries yield sat near a session low at 3.1985 percent. DOLLAR - The US dollar index was down 0.5 percent. The euro, the yen, the Swiss franc, sterling and for emerging markets, the South African rand, made the most pronounced gains. “Historically the midterm to the next election is a strong one for the market. It goes back to the presidential cycle. You'll see efforts to boost the economy, to help the President's re-election chance. "I don't think you'll see any effort, unless it’s done quickly by the end of this year, to make the tax cuts permanent or broaden them. That's off the table." "President Trump's drug price plan, the odds of it passing probably just went up some. I'm thinking about the drug stocks we own this morning. Companies that rely on a one or two drugs with very high prices, it might be bad news for them, not today, not tomorrow but over the next couple of years. You're going to see a higher likelihood of drug prices reined in than you would if the Republicans had maintained control of both houses of Congress." "In foreign exchange, we have seen a very significant shift of capital flows into U.S. assets recently, helped by fiscal policy that supported the dollar. That does not look like the case going forward. There’s less appetite to trade the Buy America theme. It could be a more challenging environment for the dollar in the next few months. "The dollar has remained fairly well-loved for a long time. Now that the election uncertainty has passed, we might see a reduction in the dollar long positions. But it’s a slow-burn story, it’s not going to change overnight. "We do not expect any significant immediate market reaction, however the prospect of key legislation will determine future market evolution." "Fixed income markets could come under some pressure if the President and Congress approve a new stimulative fiscal program however we expect 10 year yields to remain around the current levels in the coming months." "For equities, the historical precedent has been for markets to underperform ahead of the midterm elections and then rally until year-end. We expect this trend to be confirmed. "Moving towards 2019, equity markets will shift their focus more to fundamentals such as earnings sustainability. The outlook is still positive for US equity in 2019, but with a strong focus on selection as the economic and financial cycle mature." "In previous U.S. Administrations where the President was Republican and the Congress was split (Republicans with a Senate majority and Democrats in control of the House of Representatives), the S&P 500 historically has generated a total return of around 10.8 percent (going back to 1933)." "Encouragingly, the S&P 500 has also not declined in the 12 months after a midterm election going back to 1946... however, the historical precedents did not feature trade conflicts, so the next 12 months might be different." "For investors, gridlock over the next two years is potentially positive, insofar as it removes a considerable amount of legislative, tax and regulatory policy uncertainty. The initial market reaction - mostly higher overseas share prices - is consistent with this view." "At this juncture it remains premature to draw strong conclusions. Insofar as potential escalation of trade conflict remains a key concern for global growth and the performance of non-US equity markets, investors will likely remain hesitant until further clarifications of policy intent are forthcoming. In that context, the ongoing bilateral discussions between China and the US will become a key focal point." "The key questions for the currency market after today is,will the Trump administration be able to keep pursuing policiesto stimulate the U.S. economy, and will there be a shift towardsChina over trade?" "The Japanese market is resilient as it has priced in theresult which was widely expected, but the impact from theelection results could gradually pressure the market." "Investors will gradually realize that Democrats are hard onChina as well, so what has been a worry to the financial marketwon't change even after the midterm elections." "It was a good enough night for the president ... there wasn’t a ‘Blue Wave.’ I think it was a pretty good night for the markets and the U.S. economy. If we were to see fiscal stimulus, it would come in the form of infrastructure. That could be the big stimulus coming if you can put together a coalition. You can't spin a tax cut politically for the rich but infrastructure is about jobs. I think that is the likely scenario." "Things fell as expected, so we have to see if the Housewill affect the trade conflict. This really was what marketspriced-in. We may see some recovery from major counterparts, butthat alludes more to a natural recovery after the greenbackgained by over 2.5 percent throughout October." "A break of 1.13 in euro/dollar and 3.25 in 10-year Treasuryyields are significant short-term technical levels. We arewatching for potential spillover effects to other risk assets.In the short term, a Republican loss in the House, although inline with consensus expectations, should nevertheless amplifyrisk market volatility, detract from positive sentiment, and bepositive for US rates." "We are confident that these overnight moves will have nextto no bearing on the medium-term direction of asset prices asparticipants digest the final outcome and the 2019 legislativeagenda starts to take shape over the next several months." "The surprise was that there was no surprise. I thinkeveryone was bracing for any possible, crazy scenario to showitself, but it basically looks like the baseline consensus forecast was correct. If the futures are up now and they stay up it's because there is an uncertainty factor that is now out of the market." "The GOP increased its majority in the Senate by severalseats, which will make confirmations of judges andadministration officials easier and overriding his vetoesharder. It will also make conviction of Trump, if impeached bythe House, less likely." "To the extent that political uncertainty disappears, themarket is likely to be risk on, which means stock prices in theU.S. will likely rise and dollar/yen will be at least stabilizedor may rise a little bit." If one attributes part of the nearly 10 percent drop (in S&P 500) last month to a pricing-in of a worst case outcome then we may be looking at a slight, albeit short-lived, rebound in the days ahead." "Now that the elections are behind us, earnings and the Fedwill be back in focus. All indications are that neither of thosefactors support expanding multiples for stocks." "The markets were geared for the Democrats winning thehouse. Now, we are seeing the dollar selling off as it lookscertain that Democrats are in fact taking the house. This isalmost exactly in line with expectations and polls." "Trump has still got trade and policy levers and he is morelikely to go harder on trade now. That's our opinion. He willpotentially extend tariffs to all Chinese imports by February.We'll wait to see how this plays out." "In terms of major economic implications, I thinkimportantly, two things don't change. One is the 2016 tax lawchanges. With divided government, Democrats will have no abilityto roll back any of those measures. And second, trade policy.Because the president has significant authority over tradepolicy and can move forward without Congress on tariffs." "If the domestic agenda is blocked as a result of dividedgovernment, Trump could actually pivot more aggressively towardstrade because that's an area where he's less constrained and hefeels like it resonates with his base ... And whether it's goodeconomic policy or not, I think Democrats are hard pressed tostand up too aggressively to the President on trade policy." "I see scope for additional spending measures passed byCongress. That's because both parties have signaled support foran infrastructure program. Now, there are significantdifferences in terms of how large it should be, how you pay forit. And the role of the private sector in infrastructurespending. But the will is there, so I think that's one areawhere markets might be under-pricing the risk of stimulus." JUSTIN WARING, INVESTMENT STRATEGIST, UBS GLOBAL WEALTHMANAGEMENT, NEW YORK "Some parts of the U.S. equity market could begin to face headwinds over concerns about the tone coming from the Democratic House committees. For example, RepresentativeMaxine Waters looks poised to chair the House Financial Servicescommittee. She has long opposed deregulation efforts forfinancials."